I am upset out of my concern for the Manufacturing MSMEs in India, not otherwise. The idea is to share tips of making an ERP project simple & successful for the #MSMEs. 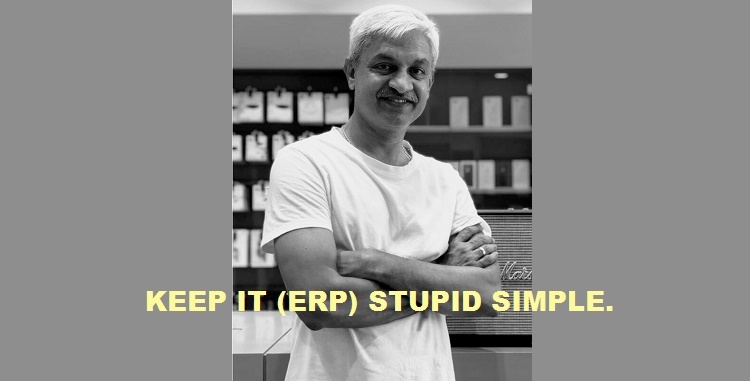 When I came across the concept KISS – Keep it simple, stupid (called KISS – principle), I felt why MSMEs should not adopt this for their ERP implementation. How MSMEs can keep #ERP implementation simple and straight forward. We know all know that the economy is slowly recovering from the demonetization and GST. The rules of the game are changing. Always opportunity and threat comes at the same time. With GST, there is a cost advantage and global reach. On the other side global competition is also increasing. MSMEs need to realize that all business process has to be in a single seamless and robust EPR system. This will help all across the enterprise to take quick and well informed decision. Islands of data can only cripple the growth of the Enterprise. From the Chairman to the Door-man has to take active part in this project in a responsible way. Let’s not bother how we were. How we are from today matters the most. Too big is complicated and too small can’t accommodate the full business. So selecting the right-fit ERP system is the critical. The word customization looks sweet, but doesn’t help. The meaning of the customization has a flip side. If the ‘must to have’ features are not reset in the solution, it will take time and cost to go-live. Such delay will be detrimental for the ERP project. The true meaning of the right-fit ERP is that the must to have features are to be there as part of the standard product. Only the ‘Nice to have’ features can be customized. Cost can kill you without ROI. Assuming Accounting software is a bike and ERP is a car. Now that your enterprise is grown, there is absolutely no doubt that you need a car. The question is whether it is a Rs.5 lacs car or a 50 lacs car. With a wrong choice you are finished. Also too much of customization will add to the cost. In India everybody knows everything. This is not an advantage. Why I say so? We tend to think, knowing is doing. It is not. We all know by eating, we can overcome hunger. But only by eating hunger goes. So there is a world difference between knowing ERP and doing ERP. Quickly go-live and Make ERP work for you. Ready to implement team with right data. Right-fit ERP system with experienced consultants, make the ERP to go-live with following steps. Management team and the user team has to work closely till the system gets into the main mainstream of the enterprise. Otherwise there will be delay in the project. Delay in implementation can throw the ERP project to the air. This will be bad situation for the enterprise. “Dhobi ka kutta na Ghar ka, na Ghat Ka”. Consider the above aspects deeply. Financial and people commitment across the board is critical for the success of the ERP project.